What is Nissans outlook for the United States? We see some further softening this year, especially in the first half. The uptick will occur in the second half. On a more mid-term basis, no matter how pessimistic you try to be, there are some [encouraging fundamentals:] population growth, the number of kids coming up to driving age, the scrappage rates. 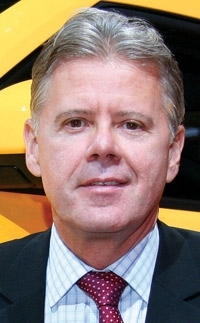 In Brian Carolin's first year as Nissan North America's senior vice president of sales and marketing, he worked to boost market share despite catastrophic economic conditions. Nissan is preparing to put its dealers into the light commercial vehicle business and to begin electric-vehicle sales in 2010. Carolin, 52, spoke with Staff Reporter Lindsay Chappell at Nissan headquarters near Nashville. Are dealers satisfied with Nissan and Infiniti? We're visiting dealers on a regular basis. They are all clearly concerned about the low level of demand. They needed to cut their overhead expense very quickly to match the revenue reduction, and they've done that very well. It's been a surprise to me how quickly they reacted. The average dealer is profitable at both Nissan and Infiniti. We have a small number who are unprofitable, and we're monitoring that very closely. We're talking about only a handful across both brands. We have a watch list of dealers, and we'll work with them to see what we can do to help. But so far -- touch wood -- given the scale of reduction in the industry overall, we've been quite fortunate. What have you done to help dealers over the past few months? We took very quick action to lower their inventories. We ended March with just a little over 60 days of inventory. That's the lowest among our competitive set -- Toyota and Honda and the Big 3. I can't tell you how grateful our dealers were. We took aggressive action on the Nissan side coming out of last year's fuel crisis to liquidate our truck inventories. Then we began to cut our truck production schedules in the U.S., Mexico and Japan. The Infiniti dealers were also appreciative of the inventory reductions we made. We will cut production again if necessary to minimize our inventories, both in our stock and at the dealerships. Cash flow in this environment is key. Dealers will go out of business for cash-flow problems rather than because the business is innately unprofitable. We also have been aggressive in fighting for our share of a declining market. We've raised our market share from 6.7 percent, prior year, to 7.2 percent [in 2008]. We've assured our dealers that we will remain in leasing, which is especially important to Infiniti dealers. We will have aggressive finance support, both in wholesale funding and in retail plans. The dealers realize that we're a player in the market and we're growing our share. Will you hang on to that market share as the economy comes back? My job is not to lose market share. It's not share at any cost. We'll always be cautious that we're not destroying brand value. But I have no intention of going backward from 7.2. How many light commercial vehicle dealers do you expect to have? We're still in the solicitation phase, but about 300. We're very much on plan. We've been visiting dealers to check their premises and validate that they can meet the requirements and if not, [explain] what they need to do. A lot of brands have added smaller, less expensive models. Will Infiniti? That's an ongoing discussion. Infiniti has probably the strongest lineup we've ever had. The issue is the extension of the range, maybe at the lower end. Coming out of the fuel crisis last year, the economic crisis this year and given what our competitors are doing, looking at the lower part of the luxury market is back on our radar screen. There was some discussion a year ago of introducing a new Infiniti flagship model. We have no plans to go forward at the moment. The fuel crisis and the economic crisis put a question mark over the viability of a high-end luxury flagship product. The dealers understand that. The Maxima was slated to have a diesel engine starting next year, but I understand that's being reconsidered. We are in a holding pattern. The situation last year, when gasoline was $4 a gallon, and the situation today, when it's closer to $2, challenges our assumptions on volumes. We're in a review period. How do you envision the market opening up for electric vehicles -- city by city or nationwide all at once? It will more than likely be concentrated in a number of cities to start. It will be heavily dependent on the infrastructure that is in place, and a number of cities are especially proactive in developing the infrastructure. Obviously, those are the cities where we will focus our initial sales. But I think it will rapidly spread beyond those markets. How long will it be before you have a complete EV market in the United States? By 2015, something on the order of 10 percent of our volume will be EV. Within the next decade, this technology will become a regular sight on the roads in most cities. The critical issue will be where the charging structures are. You are going to have hot spots in certain cities. The type of customer we attract will be somewhat self-selecting, at least initially. In the beginning, people will probably choose the EV as their second or third car and maybe reserve the SUV for their weekend trips and longer journeys. How many EV models will you likely have? You develop the first stand-alone EV model with the knowledge that it will be very concentrated in sales. You build the business case and volume plan around that. In the second generation will come the decision to take an existing vehicle and move the powertrain from internal combustion to EV. That's going to be very dependent on the success of the first wave and also the extent to which the infrastructure becomes mainstream. Whether we move our best-selling car to EV has got to be based on whether there is a nationwide charging system because we sell the Altima in every state. In 2009, it's difficult to make assumptions. What segment will your first EV be in? It will be around the size of the Prius and have the utility of a car of about that dimension. And it's going to look like a real car, with no compromise. It won't look like a toy. It won't be quirky. People won't have to apologize: "Hey, I know it looks weird, but it's an EV." I don't know how many EV competitors will be able to tick that box of looking like a real car with family utility in heart of the market. Chrysler was planning to build the next Titan pickup for you. Nissan and Chrysler put that project on hold. What's likely to happen? We've signed off on the final styling of the vehicle, which is very strong. I've seen it in Japan. The project is beneficial and profitable for both parties. So it's a win-win, and it's progressing. We're all watching what will happen with Chrysler. But I'm cautiously confident that whatever restructuring happens, the viability of the project will ensure its continuation. It's a core part of their range, and why wouldn't they want to sell our version to us? It defrays their cost. What can you tell us about the next-generation Quest minivan? It will be a full model change. It will look very different. It's a much better product. That remains a large part of the market, and the number of players in that segment has been reduced. With a much stronger focus, I think we can do well. Nissan has raised $1.3 billion through TALF, the federally guaranteed program for selling asset-backed bonds in the market. Will those funds help enable you to provide low-cost leasing and retail financing? We have told our dealers we will continue in leasing and floorplanning and remain competitive in our retail programs. But the funding is a separate issue. I wouldn't draw the connection between those TALF funds and our plans. I can't tell you if we've even received a dollar from that transaction or what the money will be used for. At some point the TALF funds will enter into the mix. But our programs are not based on them. You've given your dealers more leeway to make warranty decisions -- what they cover and what they don't. Will you tighten your rules once the market comes back? We increased the level of self-authorized goodwill. We got good feedback from the dealers. So I see no reason to change it.